In today’s digital world, keeping track of your data is more important than ever. Many people, however, still choose to store their files exclusively on their everyday computer, leaving them vulnerable to accidental deletion, security breaches, and computer damage. By investing in an external hard drive, you can keep your data safe and accessible regardless of what happens. There are several factors to consider when purchasing external data storage. Although size is typically one of the most important of these factors, this guide will focus on a selection of 5-Terabyte (5TB) models—that’s enough space to back up most computers multiple times over. As a result, this guide will focus on often-overlooked factors such as speed, compatibility, durability, and security. If you have thousands of music and video files, you’ll probably want an external storage device capable of transferring these files quickly. As of August 2017, the ultra-fast USB 3.0 is standard on most models. For many years before this, however, USB 2.0 was the most common, but most external hard drives can usually handle both. Although most external hard drives can work seamlessly with multiple operating systems, some do not; in many cases, switching between operating systems requires reformatting, a process that requires completely wiping the drive and changing its file system! Before purchasing, you should consider the hard drive’s compatibility with your current OS—otherwise, your investment may turn out to be an excellent paper weight. Since external hard drives are often targets for theft, it’s important to consider additional security features such as encryption and password protection during the purchasing process. Unfortunately, password protection and encryption can’t protect data from natural disasters and physical abuse. Because of this, many hard drives come equipped with ultra-durable cases and water-resistant technology, ensuring that your data will be able to withstand shock, water, dust, and more. In addition to a USB 3.0 cable and USB 2.0 adapter, the Seagate Expansion also includes a power supply cord. When connecting to a computer for the first time, the hard drive will automatically install Seagate’s data management software, allowing users to easily drag-and-drop files between devices. The modernly styled casing weighs 2.1 pounds and measures 7.1 x 4.2 x 1.5 inches. 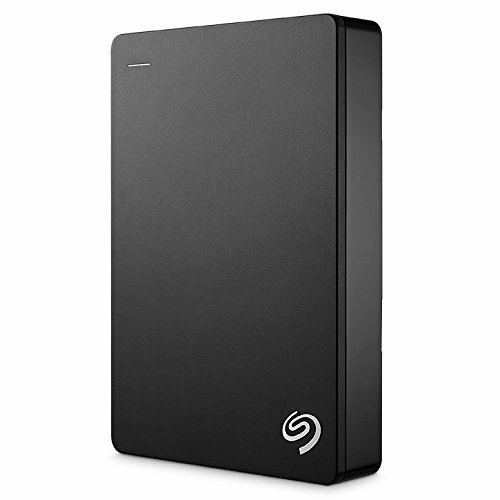 Like the Seagate Expansion, the Seagate Backup Plus is compatible with both USB 3.0 and USB 2.0. Unlike other Seagate models, however, the Seagate Backup Plus draws its power directly from the computer via USB, eliminating the need for a separate power cord. 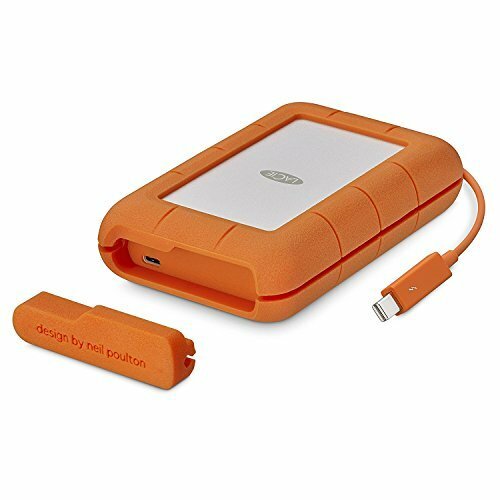 Combined with a compact size of only 4.5 x 3.1 x 0.8 inches, the Backup Plus is an excellent choice for anyone desiring portability. The Seagate Backup Plus is instantly compatible with both Windows and Mac operating systems, requiring no reformatting. For extra security, the hard drive features cloud compatibility with both Google Drive and Dropbox, ensuring that your files are always available. In addition to routine and automatic file backups, the Backup Plus can also backup your Facebook, YouTube, and Flickr accounts. 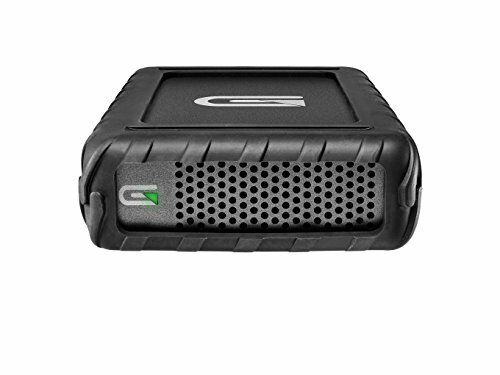 The Glyph BlackBox Pro offers its users a more rugged solution to their external storage needs: The hard drive features an all-aluminum chassis surrounded by a tough rubber exterior, ensuring that it can withstand falls and regular wear. The entire unit weighs 4.4 pounds and measures 1.7 x 5.1 x 8.2 inches. In addition to its tough exterior, the Glyph BlackBox Pro also features impressive speeds; in addition to both USB 3.0 and USB 2.0, the hard drive also utilizes Thunderbolt 3 for ultra-fast file transfer up to 220 MB/s. By default, the BlackBox Pro works with Mac OSX 10.4 and above, and is also compatible with Windows Vista and above after reformatting. Featuring one of the most durable cases on the market, the Armor A85 from Silicon Power offers its users military-grade durability for the toughest of applications. Boasting an internal suspension system housed within rubber and aluminum casings, the Armor A85 passes the US military drop-test MIL-STD 810G Method 516.6 Procedure IV, requiring it to drop on 26 contact points from 1.22 meters (4.00 feet). The hard drive also passes the IP68 dust protection standard and can withstand up to 500 kilograms (1,102.31 pounds) of force. Like most current models of external hard drives, the Armor A85 features USB 3.0 compatibility for quick file transfer. In addition to this, the hard drive also includes password protection, Lock Utility software, and a three-year manufacturer’s warranty. 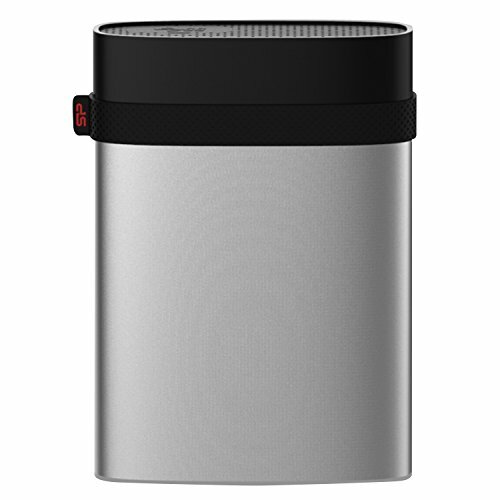 The fingerprint and smudge-resistant stainless steel case measures 5.2 x 3.6 x 1 inches and weighs 12.8 ounces. Featuring a similar durability to the Armor A85, the Silicon Power Armor A60 provides additional waterproofing features, making it ideal for wet environments. 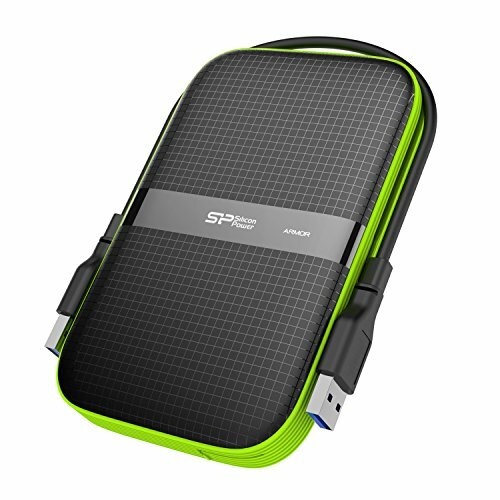 Like other Silicon Power external hard drives, the Armor A60 features an internal suspension system encased by rubber and aluminum casings. In addition to this, the A60 also passes the same military drop test and IP68 dust protection standard as the A85, and can also withstand up to 500 kilograms (1,102.31 pounds) of force. In addition to being waterproof, the case is also slip-resistant and allows for easy cord wrapping. The Armor A60 is compatible with both Mac and Windows, and features ports for USB Type-A and USB Type-C. An included Widget also features data management, backup, AES 256-bit encryption, and cloud storage capabilities. Slightly lighter than the Armor A85, the Armor A60 weighs 10.4 ounces and measures 5.5 x 0.9 x 3.4 inches. 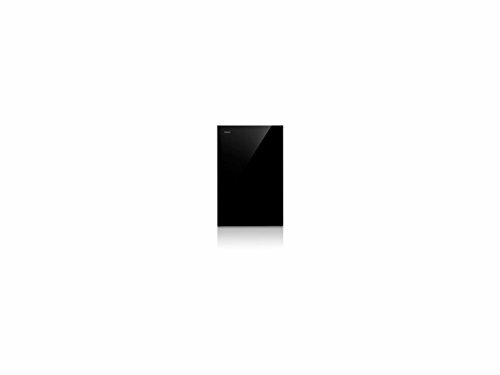 The Toshiba Canvio is the perfect external hard drive for those with a lot of data to store; although it’s rated for 5TB, the Canvio can increase its capacity to 6TB – an extra terabyte – using a unique file compression system. The hard drive includes a USB 3.0 cable for quick data transfer and is also compatible with USB 2.0 devices. Users can also switch between Windows and Mac without reformatting, allowing for seamless transfers. The Toshiba Canvio also features useful data management software, allowing its users to choose between multiple local and cloud-based storage and backup options. The software also features a file recovery system, which can restore deleted files in the event of accidental deletion. The versatile, high-gloss casing measures 6.6 x 1.6 x 5.1 inches and weighs 2.2 pounds. The Seagate Backup Plus is compatible with both USB 2.0 and 3.0, and can also switch between Windows and Mac without requiring reformatting. 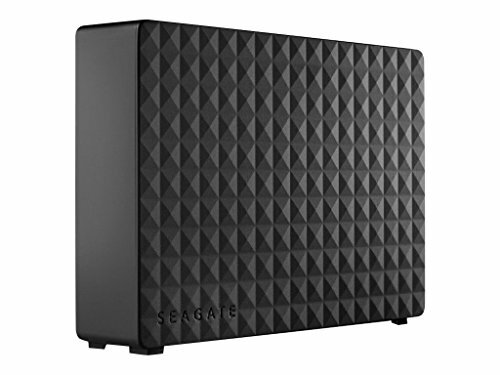 The most interesting part of this hard drive is the included Seagate Dashboard software, which allows users to manage backups and data from a single, easy-to-use interface. Here, you can schedule backups, choose which files to transfer, and even backup social media profiles and interface with cloud storage. Plus, if you want to back up your entire computer, all it takes is a single click. The elegant, high-gloss black casing measures 7.1 x 1.6 x 4.6 inches and weighs 1.9 pounds. True to its name, the LaCie Rugged can withstand shock, water, and dust, making it perfect for those expecting durability in the field. In addition to its ruggedness, the hard drive features a USB Type-C cable which can plug in at any orientation. With the USB adapter cable, you can also plug into USB Type-A ports, allowing for versatility between devices and operating systems. The rounded 3.58 x 1.34 x 5.84-inch, 1.32-pound orange case can withstand a five-foot drop and crushing forces of up to one ton. 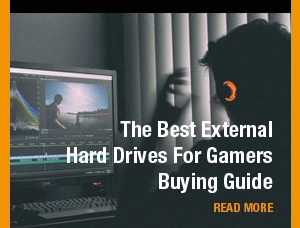 Check out our other external HDD guide such as the best 3TB HDDs and gaming HDDs.